Everyone knows someone who is or may be going to battle, whether physical or spiritual. Psalm 91 is a source of inspiration and prayer. I believe it is important to pray the scriptures. 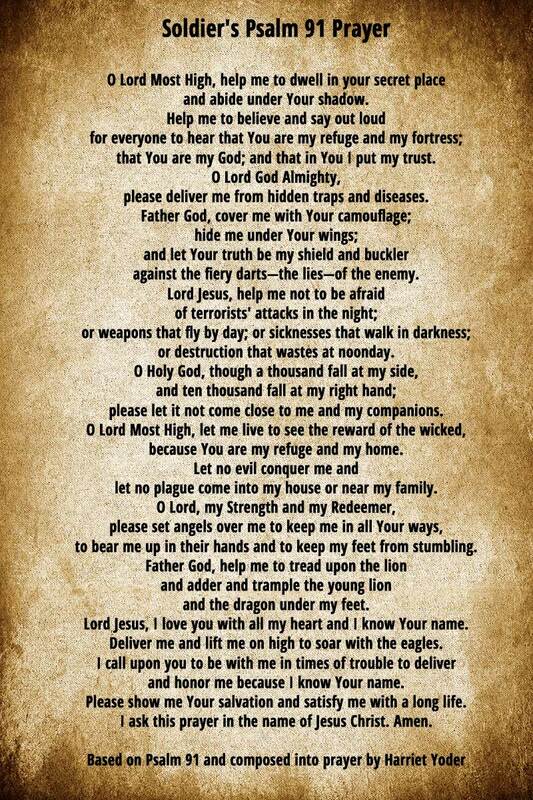 Several years ago I heard stories about soldiers using Psalm 91 to pray for safety and protection in battle. I was inspired to compose this prayer based on the King James Version of Psalm 91. Below are links to several different sizes of free printer friendly versions of the Soldier’s Psalm 91 Prayer and Psalm 91. Please make copies and feel free to share them. If you have them laminated, they will last longer! Wallet Size Soldier’s Psalm 91 Prayer They are a smaller credit card size. Printed on both sides, you can laminate and distribute it to 8 soldiers or prayer warriors. Use whatever paper you like. Wallet Size Psalm 91 to Print This printer friendly version has 8 copies per page. They are a smaller credit card size. Printed on both sides, you can laminate and distribute it to 8 soldiers or prayer warriors. Use whatever paper you like. Soldier’s Psalm 91 Prayer to Print 4 Copies per page Print 4-copy Psalm 91 on one side of the paper and the 4-copy Soldier’s Prayer on the reverse side. Laminate it, cut it, and send it to four soldiers.